Game birds are so underrated. Nowadays, you can go to a butcher and get partridge for a very reasonable sum. They are such small birds that I think they look lovely cut in half down the middle, with each half laid down on individual plates. Their subtle flavour is much less gamey than pheasant and they roast really well. If you can’t get hold of partridge, you can use wood pigeon. This recipe is magic. The stuffing melts inside the birds and the bread sits underneath, absorbing all the flavours and juices of the meat and stuffing. Alternatively, roast extra bread in the pan with the juices and make a partridge-bread salad with lots of raw baby spinach, watercress and a few capers. Preheat the oven to 220˚C/425˚F/gas mark 7. Cut the crusts off the bread and generously butter each side. Cut each slice in half and arrange in two lines in a baking tray. Season the partridge inside and out with salt and pepper. Mix the stuffing ingredients together and push inside the birds. Place each bird on top of three slices of bread, and cover with butter and slices of streaky bacon. Roast for 10 minutes, then remove the bacon, basting the birds with the pan juices (do this with the tray out of the oven and the oven door shut to keep the oven hot). Continue roasting for another 5 minutes before reducing the oven temperature to 170˚C/340˚F/gas mark 3-4. Roast for another 15-20 minutes, then remove from the oven and rest, covered with foil, for at least 10 minutes. This is delicious served with breadcrumbs fried in garlic and butter until crisp and toasted, and heaps of spinach. It’s traditional in Britain to roast game birds fast in very hot ovens. 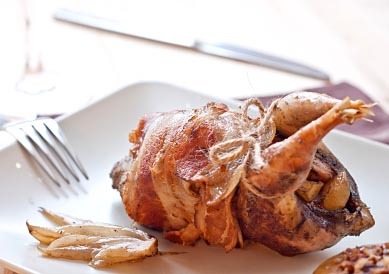 Another way you can cook a partridge is for 45 minutes at a lower temperature (180˚C/350˚F/Gas Mark 4). It’s simply a matter of preference. You could also try jointing the roast partridge into breasts, legs and thighs. Dress watercress with walnut oil and toasted walnuts, and toss through the partridge and stuffing.